Background: Traumatic brain injury (TBI) commonly presents with a constellation of findings, including physical, cognitive, and psychological disturbances. Traditionally, few options have been available for long-term management of mood symptoms for post-TBI patients who are refractory to medications. Repetitive transcranial magnetic stimulation (rTMS) is a promising alternative treatment. Case Report: A 37-year-old male with history of anxiety and bipolar depression incurred a TBI after a 60-foot fall. After his physical recovery, the patient had refractory depression. Eight months after the TBI event, he underwent a 6-week course of rTMS treatment and had a 70.8% improvement in mood symptoms by the end of the therapy as indicated by the Patient Health Questionnaire-9, transitioning from severe to mild depression according to the scoring system. Clinical correlation during the months following conclusion of rTMS therapy showed no signs of remission or adverse side effects. The patient remains stable and lives independently 1 year after treatment with mood-stabilizing medications. Conclusion: This case provides evidence for successful treatment of refractory depressive symptoms after severe TBI with the addition of rTMS to psychotherapy and mood-stabilizing medications, supporting the safety and tolerability of this novel therapeutic approach. Further studies are needed to validate the contribution of rTMS for management of mood symptoms in patients with TBI. However, interest has increased in the use of repetitive transcranial magnetic stimulation (rTMS) as a potential nonpharmacologic alternative therapeutic tool for modulating brain function.6 This noninvasive method of stimulating nerve cells in the brain uses a magnetic field that generates a current to modulate brain activity,7 and rTMS is thought to have an effect on brain plasticity during the chronic phase of recovery (>3 months post-TBI) that can help overcome long-term cognitive deficits after injury.8,9 The inaugural case study showed the benefit of rTMS in reducing depressive symptoms.10 The use of rTMS has since been validated via other studies that provided evidence of equally promising outcomes in the management of unipolar and bipolar depression.11-13 However, this form of therapy has not been thoroughly evaluated in the post-TBI patient population, particularly in patients with severe TBI, because of a lack of data regarding its safety and efficacy. In this study, we add to the limited amount of available literature supporting the safe and successful use of rTMS in the treatment of refractory depression in a patient with a history of severe TBI. Additionally, this case study showcases a new model of therapy that incorporates rTMS treatment in conjunction with current standard therapeutic approaches. A 37-year-old male with a medical history of anxiety and bipolar disorder type I sustained a 60-foot fall in July 2015 from a suicide attempt. The fall resulted in a closed head injury and multiple rib and pelvic fractures. The patient was in a coma for 11-12 days with a Glasgow Coma Scale score of 3. He required an intensive care unit stay with a tracheostomy tube for respiratory support. Initial brain scans with gradient recalled echo T2-weighted imaging showed diffuse axonal injury (Figure). 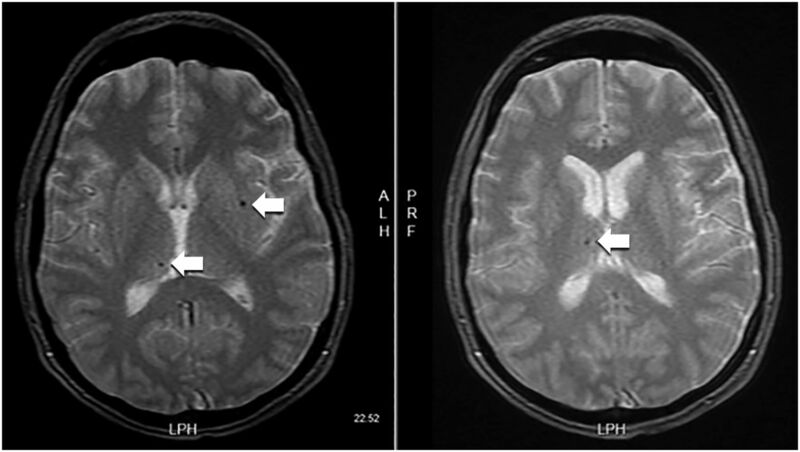 This type of magnetic resonance imaging (MRI) allows for greater sensitivity in detecting microhemorrhages compared to conventional MRI or computed tomograpy imaging.14 After discharge from the hospital, the patient was admitted to a neurologic rehabilitation facility where he initially endorsed cognitive decline and visual processing deficits. He also displayed signs of dysarthria, intermittent dysphagia, and retrograde and anterograde amnesia with no recollection of the accident, in addition to self-reported fatigue and insomnia. The patient physically improved at the rehabilitation facility until discharge in October 2015 but continued to endorse severe depressive symptoms with recurrent suicidal ideation. Symptoms were refractory to increased dosages of his psychiatric medications that included bupropion 300 mg daily before noon, olanzapine 5 mg at bedtime, oxcarbazepine 150 mg twice daily, and lamotrigine 100 mg daily. Trazodone 100 mg at bedtime was added to manage insomnia. A multifaceted approach was adopted in collaboration with the patient's neurologist in an attempt to control his mood symptoms, including pet therapy, supportive groups (eg, regular church attendance, National Alliance on Mental Illness group meetings), and lifestyle modifications. In March 2016, the attending psychiatrist changed the patient's medication regimen, substituting quetiapine 200 mg for olanzapine because of lack of response and adding methylphenidate 40 mg daily to improve concentration. Despite these changes, the patient continued to endorse suicidal ideation, and his ability to function (eg, live independently, interact with others in social situations) remained dramatically impaired. Because of the severity and refractory nature of his condition, he was referred to an outside psychiatrist to discuss the possibility of rTMS therapy. Of note, the patient did not endorse any manic symptoms throughout these evaluations, and he did not experience any posttraumatic seizure following the TBI. Figure. Gradient recalled echo sequence shows hemosiderin deposition consistent with mild diffuse axonal injury (arrows). An rTMS treatment course was adopted using standard depression protocols.15 The patient's rTMS treatment apparatus consisted of the NeuroStar TMS Therapy System (v.2.3.3). Coil position was set at 10.3 cm anterior/posterior, zero-degree angle, and stimulus onset asynchronies of 33 degrees. The patient underwent 30 treatment sessions in the outpatient setting (5 days of therapy per week for 6 weeks) of 1-hour and 2-minute duration per session. High-frequency stimulation at 6 Hz over the left dorsolateral prefrontal cortex was used. Treatment was set at a standard motor threshold (MT) level of 1.62 with treatment intensity at 120% of MT level, a 4-second stimulation time, and a 26-second interstimulation interval for a total of 3,000 pulses administered per session. The patient completed the treatment course between March 2016 and May 2016. The patient's mood symptoms were quantitatively evaluated throughout the treatment protocol using the Patient Health Questionnaire-9 (PHQ-9) to self-report mood symptoms during psychiatry visits. The patient scored 24 on the PHQ-9 after 1 week of rTMS therapy, placing him on the severe depression spectrum. As shown in the patient's weekly scores (Table), mood improvement was observed within 2 weeks of initiating treatment when the patient's score decreased to 16 (moderately severe depression). After 1 month of therapy, the patient reported being more functional and was able to relocate to an apartment and live by himself without further endorsement of suicidal ideation. At the end of 6 weeks of therapy, the patient's score improved to 7 (mild depression), constituting a 70.8% reduction in score from the beginning to the conclusion of his rTMS treatment protocol. The patient was regularly followed by the psychiatrist and neurologist who did not note clinical or self-reported adverse effects to the therapy. Subsequent visits focused on community reintegration, which included defining interests, long-term life goals, and the possibility of obtaining employment. The patient was amenable to volunteering at the rehabilitation facility where he had resided during the initial treatment for his TBI. At 2-year follow-up, he has not endorsed further mood decompensations or suicidal ideation, he has not required additional hospitalizations, and he maintains functional independence by living in his own apartment. He remains on the same medication regimen and reports adequate compliance with no severe adverse effects. The improvement in mood symptoms demonstrated by this patient is consistent with results of the few published case studies on the use of rTMS16,17 and provides further support for the safe and effective clinical use of rTMS for refractory depression in post-TBI patients, without significant side effects. TBI was considered a relative contraindication to the use of rTMS because of the risk of seizures.22 This case report and several aforementioned studies6,8,16,17 have shown that rTMS can be safely used in the TBI population. Our patient tolerated 30 sessions of high-frequency rTMS without any seizures or other clinical adverse effects. Limitations to this case study that warrant consideration include the lack of a true baseline quantitative evaluation of the patient's depressive symptoms prior to the TBI or the start of rTMS therapy. The patient did not receive any formal testing of his functional abilities; they were assessed by the neurologist based upon the patient's self-reported evaluation during each consultation. Moreover, several changes in the patient's psychiatric medication regimen started around the time of rTMS therapy initiation, including the substitution of quetiapine for olanzapine and the addition of methylphenidate. Consequently, determining the level of contribution of rTMS to his self-reported change in mood is not possible; the mood changes might have resulted from the alterations in his pharmacotherapy during the treatment protocol. However, prior attempts to adjust the patient's medications, including dose and class, did not show consistent evidence of mood symptom improvement. Finally, if the patient may suffer from possible long-term effects from rTMS therapy is unclear, as the last treatment was administered in May 2016. Worth noting, however, is that the therapy resulted in a sustained and profound long-lasting improvement in the patient's functional level from his debilitating mental illness, justifying the decision for aggressive management. Despite the increasing use of rTMS as a noninvasive therapy for a variety of psychological and cognitive symptoms, it has not yet been recognized as a standard adjunct therapy in the TBI population. Concerns remain regarding the safety and longevity of rTMS therapy, given that the physiologic effects of the treatment and the extent of stimulation that may be administered without seizure induction are not fully understood. Our case report is one of the few documented studies of successful rTMS use for debilitating mood symptoms in patients who previously incurred a severe TBI. It provides further evidence regarding the safety of this type of treatment and its positive impact when used in combination with other therapeutic interventions. Powered studies are needed to validate the contribution of rTMS in the treatment of severe depression in the post-TBI populace. Further work is also required to establish guidelines regarding definitive rTMS safety and efficacy protocols for use in this patient population.
. Traumatic brain injury-related emergency department visits, hospitalizations, and deaths - United States, 2007 and 2013. MMWR Surveill Summ. 2017 Mar 17;66(9):1-16. doi: 10.15585/mmwr.ss6609a1. Axis I and II psychiatric disorders after traumatic brain injury: a 30-year follow-up study. Am J Psychiatry. 2002 Aug;159(8):1315-1321.
. Psychiatric disorders following traumatic brain injury: their nature and frequency. J Head Trauma Rehabil. 2009 Sep-Oct;24(5):324-332. doi: 10.1097/HTR.0b013e3181a712aa.
. The prevalence and symptom rates of depression after traumatic brain injury: a comprehensive examination. Brain Inj. 2001 Jul;15(7):563-576.
. Treatment for depression after traumatic brain injury: a systematic review. J Neurotrauma. 2009 Dec;26(12):2383-2402. doi: 10.1089/neu.2009.1091.
. The role of transcranial magnetic stimulation in treatment-resistant depression: a review. Curr Pharm Des. 2012;18(36):5846-5852. Health Quality Ontario. Repetitive transcranial magnetic stimulation for the treatment of major depressive disorder: an evidence-based analysis. Ont Health Technol Assess Ser. 2004;4(7):1-98.
. NIBS-driven brain plasticity. Arch Ital Biol. 2014 Dec;152(4):247-258. doi: 10.12871/00039829201445.
. Noninvasive brain stimulation to modulate neuroplasticity in traumatic brain injury. Neuromodulation. 2012 Jul;15(4):326-338. doi: 10.1111/j.1525-1403.2012.00474.x. Daily repetitive transcranial magnetic stimulation (rTMS) improves mood in depression. Neuroreport. 1995 Oct 2;6(14):1853-1856.
. Clinical and demographic predictors of response to rTMS treatment in unipolar and bipolar depressive disorders. Clin Neurophysiol. 2017 Oct;128(10):1961-1970. doi: 10.1016/j.clinph.2017.07.395.
. Transcranial magnetic stimulation: a potential new treatment for depression associated with traumatic brain injury. Brain Inj. 2015;29(7-8):789-797. doi: 10.3109/02699052.2015.1009168. Therapeutic efficacy of right prefrontal slow repetitive transcranial magnetic stimulation in major depression: a double-blind controlled study. Arch Gen Psychiatry. 1999 Apr;56(4):315-320.
. GRE T2*-weighted MRI: principles and clinical applications. Biomed Res Int. 2014;2014:312142. doi: 10.1155/2014/312142.
. Repetitive transcranial magnetic stimulation for treatment-resistant depression in adult and youth populations: a systematic literature review and meta-analysis. Prim Care Companion CNS Disord. 2015 Nov 5;17(6). doi: 10.4088/PCC.15r01807. Transcranial magnetic stimulation for depression after a traumatic brain injury: a case study. J ECT. 2011 Mar;27(1):38-40. doi: 10.1097/YCT.0b013e3181eb30c6.
. Preliminary guidelines for safe and effective use of repetitive transcranial magnetic stimulation in moderate to severe traumatic brain injury. Arch Phys Med Rehabil. 2015 Apr;96(4 Suppl):S138-S144. doi: 10.1016/j.apmr.2014.09.010.
. The PHQ-9: validity of a brief depression severity measure. J Gen Intern Med. 2001 Sep;16(9):606-613.
. Validity of the patient health questionnaire-9 for DSM-IV major depressive disorder in a sample of Canadian working population. J Affect Disord. 2015 Nov 15;187:122-126. doi: 10.1016/j.jad.2015.07.044. Efficacy and safety of transcranial magnetic stimulation in the acute treatment of major depression: a multisite randomized controlled trial. Biol Psychiatry. 2007 Dec 1;62(11):1208-1216.
. Repetitive transcranial magnetic stimulation for the treatment of depression. Systematic review and meta-analysis. Br J Psychiatry. 2003 Jun;182:480-491.
; Safety of TMS Consensus Group. Safety, ethical considerations, and application guidelines for the use of transcranial magnetic stimulation in clinical practice and research. Clin Neurophysiol. 2009 Dec;120(12):2008-2039. doi: 10.1016/j.clinph.2009.08.016.